People get these big eyes when they hear about other people winning all these free prizes just by signing up for online sweepstakes. Sure, it’s a great deal, but you can’t just search for anything and sign up for anything. You’re just asking for trouble if there is no discipline or method to the madness. If you’re going to sign up for competitions, you have to use common sense, and you have to do a little research. There are plenty of reputable companies. Sure, it will take a little extra time to find the right ones and weed out the bad ones. But, once you have a list of them, you’re set to go indefinitely as you continue to find new ones here and there. Many of these online sweepstakes competitions allow you to continue to sign up on a regular basis. Now, here is some information about warning signs to look out for when signing up for these sweepstakes. If something looks too good to be true, then it most likely is too good to be true. It’s not that you can’t sign up for grand prizes, but for instance, one big warning sign is when a site has you involved in an endless survey. Do not get caught up in these surveys. They are just trying to sell you stuff and have no plans to pay out. Another warning sign is when you get funny sounding emails that lead you to unfamiliar sites. Pop-up messages and downloads are another warning sign. Do not download anything. Overall, it just takes a little common sense so that you don’t get caught up in something that will end up causing you trouble. Search a site to make sure there are no “scam listings” in the search results. That is another helpful warning sign. « today.com/klgandhoda The KLG & Hoda Give It Away! Thank you. For entering me into gwy no. 4900, 1400 8800,3600 1835,1830. I appreciate all of your help, and pray that I am a winner. PRIZE #1- IT HAS TAKEN ME ALL DAY TODAY TO FIND FIND GWY NO. 8800, TO ENTER TO WIN $5,700,000.00 THE LUMP SUM SUPER PRIZE THAT PUBLISHERS CLEARING HOUSE HAS. SORRY YOU MISSED MY HOUSE BUT HERE I GO AGAIN TO AT LEAST TRY TO WIN SOMETHING. P.S. HOPE YOU GET MY ENTRY IN TIME TO GET ON THE WINNERS SELECTION LIST. Have been playing for so many years but have never won anything. What does it take? Sheer luck I guess! Hoping this is the right time! Thanks for the opportunity to win it all. DOUGLAS ROGERS .is this real. Maria Melius claim 3 prize from pch prize patrol $7,000.00 a week for life. I wish I could win I have been playing, twice or three time since 2015. I been a VIP by playing pchsearh&win, pchlotto and cards, I been trying the hardest to win. I never win anything big in my entire life, I am hoping that I win as a VIP. Hello all. I want to win, but i think about all the people who also want to win. I get a lil down when i try hard to win. I send all mail back and i enter every pch assignment, so where do i go wrong? Thanks and blessing to all. I hope to win the 5,000.00 a week forever prize! This is a great year for change and I have a lot of things I would like to do with that kind of money, including helping a lot of people like family and some furry friends I have! Thank you publisher’s clearing house! I hace been out of work for 3 year if when i win my sons a i will open a business and. I have been in this contest for 40 year. I won! PCH THANK YOU FOR GIVING US ALL SO MUCH HOPE. TELL MS. PAT REID THAT I AM SO SORRY IT TOOK SO LONG TO GET HER ALL THE INFORMATION. ALL OF YOU WILL NEED A COURIER FEE TO SEND TO PCH TO GET THE PRIZE DELIVERED OR THE PRIZE PATROL WILL SHOW UP AT YOUR DOOR; WHICH SHOULD NOT COST YOU ANYTHING. IF YOU PLAY THE LOTTO, HAVE SOME CASH ON HAND. THE ANNOUNCEMENT BY PCH COULD BE PRIVATE; WOULD YOU NOT LIKE THAT? I HAVE A POEM I’M SENDING YOU PCH; THE NAME IS “EACH LIFE AFFECTS ANOTHER.’PCH DON’T STOP NOW.’ I SENT YOU A MONEY ORDER, FOR YOU TO SEND THE MONEY. I hope to have a receipt waiting for Ms. Reid tomorrow, APRIL first 2015. I cannot describe this winning feeling! HELLO , OUT THERE , MAKES ONE WONDER HOW IN THE HELL CAN 15 DIFFERENT PEOPLE HAVE THE SAME NUMBERS , IF ONLY 15 HAVE IT AND NOT 5000 DOE’S ANYONE REALLY KNOW WHAT IS GOING ON ? IF SO PLEASE ENLIGHTEN ME . 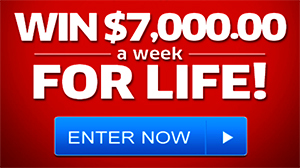 I want to win the first prize 7000$/ A Week Life Time. Dear friends: greetings, it’s a time to installing , register ,activate and exciting my PCHGWY No.4900 .the numbers are:627297743317 and 6372 3112 1417 . Tanks for participate and all .M..E.